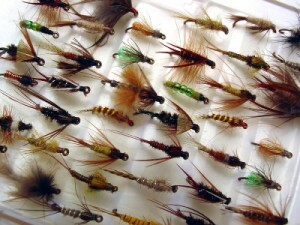 Entomology, a branch of zoology that deals with insects, otherwise known as “what fly should I use?” Nymphs, dry flies, or streamers. Just one of the many topics at the “Fish Like a Guide, But Live Like a Client” fly fishing school at Healing Waters Lodge in April and May. Classes are great for newcomers to the art of fly fishing and for those who want to brush up on their skills and advance their techniques for success in catching trout. Elements of a good fly cast, types of casts, knots, reading the waters, fishing methods while wading versus from a boat, landing a fish and handling a fish are just a few more topics in the school. Price of the fly fishing school includes a single room and all meals at Healing Waters Lodge, classroom time, practice on local waters, use of Lodge fly fishing equipment and gear. April – Arrive April 17th, school is 18-22, depart on the 23rd. May – Arrive May 2nd, school is 3-7, depart on the 8th. For more information, call Mike Geary at 406-459-2030 today!